Q: Who is the Virgin of Izamal? A: Some forty miles east of Merida, the capital of Yucatan, is the quiet, old fashioned, colonial town of Izamal. In the center of town lies the great Monastery of Izamal, which houses one of the most venerated Marian statues in all of Mexico. To this statue are attributed thousands of miracles of healing. The usual Christian explanation for these miracles is that the prayers of the pilgrims call forth the benevolence and therapeutic powers of Mary. Maybe yes, maybe no. 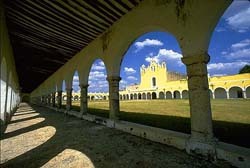 Let us examine Izamal's history more deeply and perhaps another explanation for the miracles will present itself. During the time of the Spanish conquest of Yucatan (1527-1547), Izamal was one of the largest and most beautiful cities on the peninsula. A pilgrimage site since as early as 1000 BC, Izamal had become the most important religious center in northern Yucatan during the Early Classic Period of AD 300-600. The city was considered by the Mayans to be the abode of Kinichkakmo, a manifestation of the sun god, and of the god Itzam Na (the name Izamal derives from the god's name). Itzam Na was a deity of healing and resurrection, the creator of arts and writing, and the introducer of many important agricultural items. He was also head of the Mayan pantheon, bearing the title of ahaulil or 'Lord' and was shown as presiding over a collection of lesser deities. Following the capture of Izamal by the Spanish, the local population was enslaved and forced to dismantle the top of an enormous pyramid in the center of the city. Upon the now flattened pyramid, at the place where previously had stood the sanctuary of the god Itzam Na, the enslaved Indians were forced, in 1553, to erect a monastery and church. This was done because of the Christian belief that a church would discourage the Indians from their 'devil worship.' Soon after the consecration of the church and the installation of the Marian statue, miracles of healing began to occur. These miracles were explained by the Christian authorities as resulting from the grace of Mary. Yet, were the miracles really caused by the wooden statue of Mary inside the church or might they be better explained by reference to the Mayan's mythic beliefs about the power of Izamal. The Mayans had built their pilgrimage shrine to Itzam Na, as a god of healing, at this precise location, and, if we have no records of healing miracles in Mayan times (other than those encoded in the myths), it is only because the Christians burned all the Mayan writings and libraries during their conquest of Yucatan. This author believes, then, that the miracles of healing at Izamal were caused by a combination of factors including the specific energies of the earth at the site (the reason the Mayans originally choose the place), the prayers of the pilgrims, whether they be to Mayan gods or the Christian Mary, and the psychic field that had been created over time by the thousands of pilgrims who have visited the site. Izamal's Mayan structures have not been reconstructed, like those at nearby Chichen Itza, therefore the town is seldom visited by tourists. The sleepy little town comes to life twice a year however, when thousands of Mayans come on pilgrimage for the October 18 Procession of the Black Christ and the December 8 Procession of the Virgin of Izamal. Source: Places of Peace and Power: The Sacred Site Pilgrimage of Martin Gray.